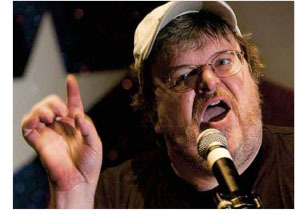 LOS ANGELES -- Hollywood's most successful "independent" documentary film-maker, Michael Moore, has issued a challenge to the religious world to consider American hypocrisy and psychopathology in a mass e-mailing promoting "socialism" and Capitalism: A Love Story. Moore's message, "to those who call yourselves Christians (Muslims, Jews, Buddhists, Bill Maherists, etc. . . .) has outraged some observers as grossly hypocritical considering his financial ties to "PharmaMedia" moguls advancing H1N1 vaccines, population controls, and New World Order politics and propaganda. Moore claimed to speak for the first time about his spiritual beliefs, cautioned against religious proselytizing, but "did a great job promoting 'socialism' as a gross hypocrite working for the world's wealthiest Capitalists," says Dr. Leonard Horowitz, a Harvard-trained expert in media persuasion and producer of In Lies We Trust: The CIA, Hollywood & Bioterrorism. "Moore 'yammers' about American war mongering, invading other countries, when his Big Pharma backers, a.k.a., Hollywood producers and billionaire media moguls, expand their wealth and population control agendas, including poisoning people with everything from napalm to FLUMIST," Dr. Horowitz warns. Surely Moore knows that without propaganda driving military conflicts and pharmaceutical wars against AIDS, cancer, and crime, his Capitalist co-producers might go broke. War waging requires propaganda, and Hollywood delivers it, in this case funded by the same people Moore blames for America's failing economy. Moore charges with neo-Marxist zeal, "Blessed are the wealthy for amassing more and more loot -- and they do their best to pay little or no income tax (last year Goldman Sachs' tax rate was a mere 1%!). . . . Would Jesus be a Capitalist? Would he approve of a system that has allowed the richest 1% to have more financial wealth than the 95% under them combined?" Shocking evidence proves Moore is working for that "richest 1%." His co-producers are the people he indicts as enemies of "We the People." His backers include Harvey and Bob Weinstein, Lloyd Blankfein, and their partners in pharmacogenocide, Rupert Murdoch, David Rockefeller, and George Soros--the wealthiest industrialists in the world, partners that have abused the Capitalist system for decades, leveraged American politics, and co-created our global economic crisis. Now they enable this fat propaganda pimp to declare salvation lies in "socialism." Examine these allegations and connections for accuracy. . . . The Weinstein Company, a division of ABC/Disney funded by the CEO of Goldman Sachs, billionaire, Lloyd Blankfein, has co-produced the last three Moore blockbusters--SICKO, Faranheit 911, and Bowling for Columbine. Yes, the very same Goldman Sachs and Blankfein that Moore says is the chief Capitalist evildoer in his film evidences an unparalleled hypocrisy. Documenting BigPharma's complicity, and Moore'sinsincerity, Blankfein is a major shareholder in the H1N1 vaccine maker of FLUMIST. Advancing civilization's intoxication and population reduction, this concoction transmits genetically-unstable lab-created viruses spreading rapidly from those injected to those not vaccinated. As these vectors of illness spread, they mutate recombining with deadlier viruses risking worsening pandemics. Falsely alleged to be "safe and effective," most of the bogus safety tests of Merck & Co.'s H1N1 vaccine was done under the direction of Rupert Murdoch's family-run facilities in Australia--The Murdoch Children's Research Institute (MCRI) and Royal Women's Hospital collaborating with CSL, Inc.
And this is just the "tip of the iceberg" in gross criminal conflicting interests that persuaded Moore to neglect his co-producers connections to BigPhara. As though payment for population poisons is more damning than the drugs themselves, Moore's camera focused on third party payers--the Insurance Industry--shielding his PharmaMedia bosses from the exposing light of truth. 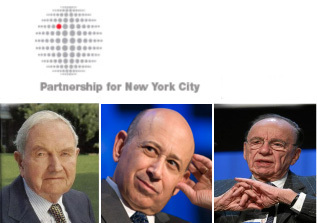 Mr. Blankfein is Rupert Murdoch's Co-Chairman for the David Rockefeller-founded, Royal Family of England chartered, Partnership for New York City (PFNYC)--the world's most powerful drug ring, vaccine syndicate, and biotechnology trust. 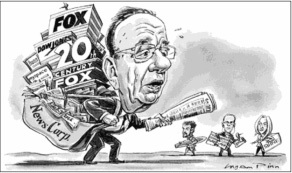 Helping Rupert run his family "business," News Corp., is his heir apparent, James Murdoch. James is a supervising director, overseeing the Board of Directors to GlaxoSmithKlein, another major H1N1 "Swine Flu" vaccine maker. 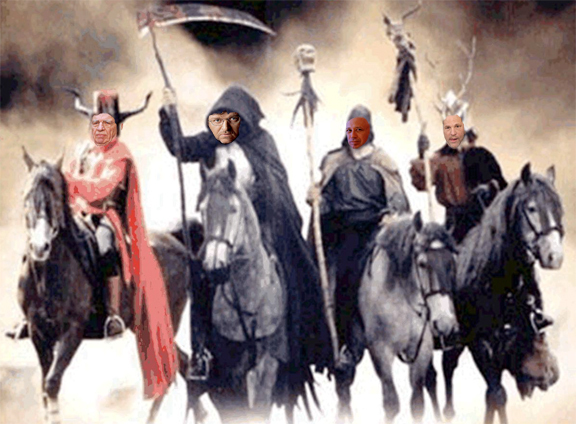 As documented in Dr. Horowitz's book,DNA: Pirates of the Sacred Spiral, the PFNYC, along with George Soros's Applera Company, are intimately linked to the US Department of Energy, the Royal Family of England's main philanthropic beneficiary, The Wellcome Trust of London, and Rockefeller assets, all key players in the pirating of the Human Genome Project a decade ago. This fraud enabled the lucrative genetic patents markets to be privatized, that is monopolized, on behalf of this Anglo-American controlled pharmaceutical cartel. The partners are intent on evolving "genetopharmaceuticals" and New World Medicine merging Hitlerian eugenics and modern biotech. Most overlooked, Mr. Tony White, was reassigned by George Soros to run Applera following his 26-year tenured position as chief administrator of the Baxter Corporation--the company at the center of the H1N1 Flu vaccine controversy. Baxter shipped vials laced with the deadliest H5N1 influenza virus by "accident" last winter to companies across Europe. The company was predicted to unleash a mutant H1N1 bioweapon in the Ukraine, as has happened, according to political prisoner, Joseph Moshe, previously a microbiologist working for the Israeli Mossad. The current economic "crisis" was predicted by those Moore bemoans as "Capitalists," especially financial industrialist George Soros in his three books. Soros said the world financial system had effectively disintegrated, adding that there was no prospect of a near-term resolution to the crisis. As heralded by Reuters, a news service run by Thomas H. Glocer, a Merck & Co. director and another partner in the PFNYC, Soros announced, "We witnessed the collapse of the financial system. . . . It was placed on life support, and it's still on life support. There's no sign that we are anywhere near a bottom." Curiously, this statement was made synchronous with the mailing of Baxter's H5N1 avian bioweapon to vaccine labs across Europe. Coincidentally, Soros's current prescription for resuscitating the ailing global economy is virtually the same as Moore's! 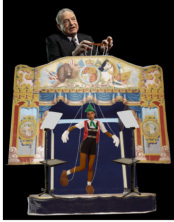 In the words of Soros's favorite hedge fund manager, Victor Niederhoffer, "Most of all, George believes in a mixed economy, one with a strong central international government to correct for the excesses of self-interest." Is this global "Socialism"? You bet! 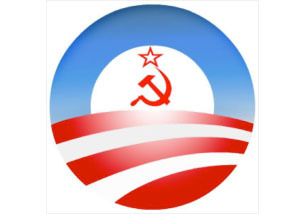 In fact, it is International Socialism, directed by corporate fascism; the same kind that successfully fueled the Third Reich, and now this rising Fourth Reich. This is what the advancing New World Order-ism (NWOism) promises, and that's not all. . . . Monotheism (the New World Religion) is piggybacking (or should we say "piggy-banking") along with International Central Banking, all on tap for civilization's salvation under Moore's bosses direction. "Major sociopolitical and economic upheaval has accompanied every grand plague," Dr. Horowitz recalls. "'Excess populations are war material,' says the Report From Iron Mountain, that best explains what is happening geopolitically, financially, and theologically. . . . Read this, together with the pre-Nazi diatribe Protocols of the Elders of Sion, and you never need to read another newspaper. You've got the gist of world news. Protocols even states poisonous inoculations will be used to advance global fascism." "This much like the Book of Revelation (18:2-4;23-24)," he adds, "tying the End Time's deadliest plagues to drug industrialists (sorcerers) that deceive the wealthiest global merchants contenting with 'unclean and hateful birds.'" 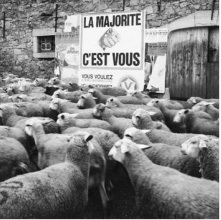 To advance this rising Neo-Nazism, aka NWOism, by way of corporate fascism and paid political prostitution, people are herded like cattle by fear of eternal damnation, starvation, dehydration, and infections. Public health officials candidly proclaim their objective is to gainherd immunity. Internationally, governments decree this urgency to advance fraudulently tested vaccines, declare mind-numbing mercury "safe ," and get people feverishly intoxicated (i.e.,hypersensitized, called "immunized") under the guise of prevention. In Hitler's day, it was called disinfection. It was the "public health" solution for the "Jewish question"--a cure for the banking industry's politically-imposed problem. This, exclusively, is the "heart of the beast" that Moore calls SICKO, yet conveniently neglects in his documentaries. So Moore's hidden backers and psycho-social agenda is now transparent. Capitalism: A Love Story is a propaganda piece promoting the New World Order's agenda--centralized global governance to foster his bosses "socialist" philosophy and profitable theologies. Moore has the nerve to ask, "What would Jesus do?" It is very likely that Jesus would have taken out a whip and beat the crap out of this fat fraud! 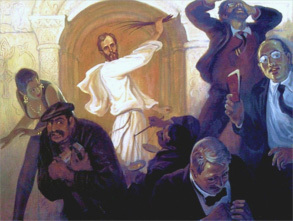 He did that to the money lenders in front of the temple gates for being gross hypocrites,suckering innocent ignorant temple-goers who knew nothing about loan-sharking and crippling interest rates. Why would population reduction be an option for money makers feeding on customers? Because protecting assets against revolutionary uprisings is even more important; foremost for "national security." The 1%--including the Royal Family of England's Rothschild banksters, the American Rockefellers, Aussie Murdochs,' and New York's "Partnerships," generate Hollywood films to mold mind-sets; and now advance a new "ism"--not Capitalism, Socialism, or Communism. This is NWOism. In the grand tradition of herding their cattle, and blaming their victims, Moore encourages, "When you are in church . . . I am asking you to allow your better angels come forward." "Capitalism is opposite everything that Jesus (and Moses and Mohammed and Buddha) taught. It is evil to take the majority of the pie and leave what's left for everyone to fight over. Jesus said that if you failed to house the homeless and feed the hungry, you'd have a hard time finding the pin code to the pearly gates . . . . Please know that I promise to do what I can to stop this evil--and I hope you'll join me in not giving up until everyone has a seat at the table." Moore's message is much like, "Let them eat cake," attributed to Marie Antoinette, not Jesus's miracle of Faith feeding thousands with a single loaf of bread. Even disregarding the facts cited above, or the common aversion to conspiracy theories inadequately evidencing conspiracy realities, does Moore appear malnourished? 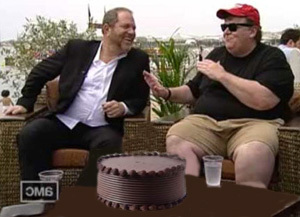 It's laughable to envision fat-boy Moore sitting at a table with plump Weinstein here, discussing Judgment Day, and relishing sharing that big chocolate cake sitting in front of them. Can't you just imagine Moore prodding, Gee wiz, Harvey, maybe we should tithe 10% of our ticket sales, or share some of this cake with the poor hungry people from Skid Row. NOT! Judge this book by its cover, and look beneath Moore's costume. He is obviously not a model for moderation. By all reasoned analysis, he is a disgusting hypocritical gluttonous prostitute for the SICKOs that command control over everyone and everything engaging their cult. Moore really could care less about "We the People." But he sure loves his money and chocolate cake! Moore fans proudly proclaim his entertaining and biting commentaries in Farenheit 911,Bowling for Columbine, SICKO, and now Capitalism. But he neglected the real "SICKOS" in all these films. Somehow Moore missed the prime players among the indictable war monders and drug dealers and war mongers, including Secretary of Defense Donald Rumsfeld, a major shareholder in toxic Tamiflu, conducting biochemical warfare on "We the People." How could he have missed his co-producers' financier, Lloyd Blankfein, with his $15Billion acquisition of the H1N1 flu vaccine maker, MedImmune/AstroZeneca. This story, alone, is worthy of a documentary. If Moore really intended to do justice to Capitalist SICKOs, and their genocidal impacts on society, he should have disclosed the conflicting interests of those battling "overpopulation," yet directing the World Bank's extortionate loans given only to countries that vaccinate people for better "disease control" and longevity. These members, such as George Soros, in the Council on Foreign Relations and Carlyle Group, profit by correcting overpopulation using "chemotherapy." Soros. Moviegoers might be interested in these investors who have sickened and enslaved humanity better than any tyrant in world history. In other words, distraction, deception, and persuasion via the silver screen on behalf of these SICKOs is Moore's traitorous trade. Ironically, he tells us that Jesus, who viewed tax collection as a form of extortion or prostitution, was the first Socialist. Moore wrote, "you can't call yourself a Capitalist AND a Christian, because you cannot love your money AND love your neighbor if you deny your neighbor the ability to see a doctor." This appeal for Obamacare is clear. 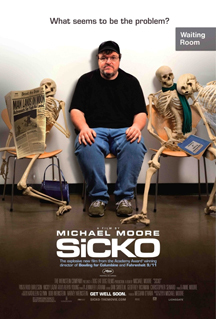 Rather than making a political difference through honest film-making, Moore's Love Story andSICKO advances American health care conformance with Senator Jay Rockefeller's and Steven Burd's globalist agendas. 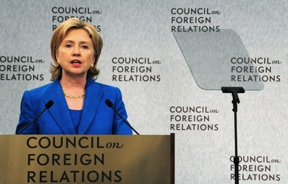 By projecting Americans discontent with insurance providers, Moore promotes our current CFR diplomat, Secretary of State, Hillary Rodham Clinton's socialized medicine mandate. "We The People" are dying from petro-chemical pharmaceutical intoxications from decision made in private organizations, such as The Population Council, wherein overpopulation has been targeted for a two-thirds reduction, and oligarchs decide how they shall kill us next. "Clearly, their method of choice," Dr. Horowitz evidences in this numerous books and films, "is the old 'Russian Biological Cocktail' method named and invented probably by American biochemical weapons enthusiasts. First they exposure you to chemicals in the air, foods, and water. Then they release their deadly microbes. The chemicals whack immune systems increasing death risks from infections." It's an ingenious, untraceable, most profitable plot to do us in while reducing their risk of revolutionary uprisings. Ironically, not coincidentally, the week Moore's film Capitalism debuted, his favorite financiers, the Weinstein brothers, releasedInglourious Basterds. This film celebrates the fictional demise of Nazi propaganda minister Josef Goebbels. 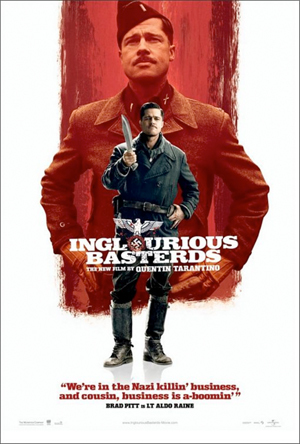 Obviously, Quentin Tarantino was obliged to neglect Goebbels' alliance with Hitler's Rockefeller and Rothschild banksters, and his favorite American "Grand Dame of Eugenics," Margaret Sanger. "If you tell a lie long enough," Goebbels said, "eventually it will be believed as truth, and the greater the lie more people will believe it." A lot of people are believing Michael Moore to be a friend of commoners and an irritant to the world's wealthy. For this New World Class act, instead of an Oscar, Moore wins my award for Hollywood Hypocrite of the Century. About the author: Sherri Kane is a freelance investigative journalist and FOX News Network defector. Ms. Kane is the Co-Founder, with Dr. Horowitz, of Healthy World Organization(HWO) currently advancing as an alternative to the duplicitous World Health Organization (WHO). Dr. Leonard Horowitz is a contributing editor of this article, and the author of sixteen books including three American best-sellers, Emerging Viruses: AIDS & Ebola--Nature, Accident or Intentional?, Healing Codes for the Biological Apocalypse, and Healing Celebrations: Miraculous Recoveries Through Ancient Scripture, Natural Medicine and Modern Science. For more information about the 2009 Swine Flu fraud, the dangers of flu vaccinations, and a new web page (titled "SICKO") devoted to this article, see Dr. Horowitz's comprehensive website FLUscam.com. Dr. Horowitz's recommendations for flu prevention and prompt remediation are in the FLU "TO Dos" section of FLUscam.com, along with links to his endorsed silver hydrosol formulated to make risky vaccinations and deadly antibiotics unnecessary. See: OxySilver.net or call toll free, 1-888-KO-GERMS, for more information about this so-called "drug" that "cures" pharmaceutical humanicide. Join our SPECIAL PRAYER SERVICE next Tuesday Night, 5-6PM Pacific Time, when Dr. Horowitz and Officer Jack McLamb will be praying with thousands of people worldwide for the Creator's blessings of protection from the sinister actions of those traitors exposed above.CLICK HERE at that time to join the service. 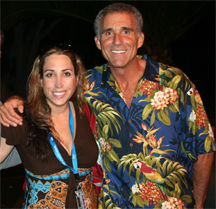 Then later that night, join Dr. Horowitz and journalist Sherri Kane on The Insight Hour, 9-10PM Pacific Time, Tuesday night, televised over LOVE528TV.net, FLUscam.TV, andBBSRadio.com. Click any of these three links to watch. Dr. Horowitz will be discussing the successful RESOLUTION, posted on FLUscam.com, just passed nearly unanimously in the County of Hawaii, advancing freedom from mandatory vaccinations for everyone living on the Big Island of Hawaii. Naturally, this was opposed by the State's health officials. Wait to you hear what Dr. Horowitz and friends have in store for those officials. . . . Don't miss the show!